Michael's friend Ashley always said that she loved his smile, and Michael wanted to keep it that way. However, Michael was unaware that he had a small cavity starting in one of his front teeth. Even though Michael had felt a little twinge now and then when he ate ice cream and candy, his favorite foods, he had not paid much attention. Michael never would have known that he had a cavity if he had not gone to the dentist for a regular checkup. Luckily, the dentist was able to drill out the decay and fill the cavity before it got worse. Michael vowed to do a better job in the future of brushing, flossing, and cutting back on sugary snacks. Cavities, also known as caries (KARE-eez), are areas of decay on the teeth that are caused by bacteria * . They are one of the most common of all human diseases. Almost half of American children have had a cavity by age four. Not only children have cavities, however. Teenagers and adults also are prone to tooth decay. Fortunately, most cavities can be prevented by taking good care of the teeth, eating a healthy diet, and getting regular dental care. The human mouth is home to a host of bacteria. The type of bacteria that causes cavities most often is Streptococcus mutans (strepto-KOK-us MU-tanz), but other types play a role, too. Such bacteria in the mouth change the sugars and starches in food to acid. The bacteria and acid combine with mucus * and food particles, forming a sticky mass called plaque on the teeth. Plaque is the rough substance that people feel when running their tongue over their teeth several hours after brushing. * bacteria (bak-TEER-ee-a) are round, spiral, or rod-shaped single-celled microorganisms without a distinct nucleus that commonly multiply by cell division. Some types may cause disease in humans, animals or plants. * mucus (MYOO-kus) is a kind of body slime. It is thick and slippery, and it lines the inside of many parts of the body. The acid in plaque can eat a hole in a tooth's enamel, the hard substance that covers and protects the outside surfaces of the tooth. People hardly notice the cavity at this stage, or they might feel a slight twinge when eating foods that are sweet, very cold, or very hot. However, bacteria that enter the hole in the enamel can make their way through the softer inside parts of the tooth. Eventually, the bacteria may reach the tooth's pulp, the soft tissue in the center of the tooth that contains nerves and blood vessels. When this happens, the blood vessels can swell and press on the nerves, causing a painful toothache. Left untreated, infection of the pulp by bacteria can cause the blood vessels and nerves in the tooth to die. Cavities are most likely to form in the areas where plaque sticks to the teeth. The acid in plaque can eat a hole in a tooth's enamel, allowing bacteria to reach the tooth's pulp. Left untreated, infection of the pulp can cause the blood vessels and nerves in the tooth to die. If a cavity is found, the decay process can be stopped by removing the decayed part of the tooth with a special drill. If there is a lot of decay, or if a tooth is very sensitive, the dentist may give the person a shot of anesthetic * or have the person breathe an anesthetic gas before drilling. The decayed material is then replaced with a filling. 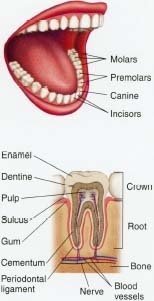 Such fillings can be made from a number of materials. The most common is silver amalgam (a-MAL-gam), an alloy of silver and other metals, which is used mainly in back teeth. Fillings in the front usually are made of other materials that match the color of the teeth. Scientists as far back as the early 1900s noted fluoride's role in preventing tooth decay. Fluoride can even reverse the early decay process. Since the 1940s, some communities in areas where natural fluoride is low have been adding extra fluoride to their water. This is a very effective and inexpensive way to help prevent cavities on a large scale. Smith, Rebecca W The Columbia University School of Dental and Oral Surgery's Guide to Family Dental Care. New York: W. W Norton, 1997. American Dental Association, 211 East Chicago Avenue, Chicago, IL 60611. The leading national organization for dentists has information about tooth decay and dental care on its website. U.S. National Institute of Dental and Craniofacial Research, 31 Center Drive, MSC 2290, Bethesda, MD 20892-2290. Part of the U.S. National Institutes of Health (NIH), this agency provides information on tooth decay and dental care.